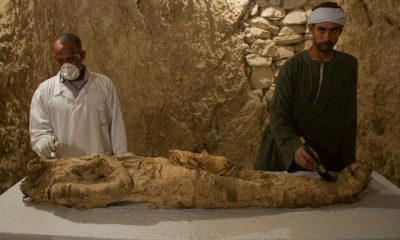 Russian researchers have analyzed tissue samples from one of the mummies, Maria, a 5th-century mummy, has a different anatomical structure from humans. However, preliminary analysis of the samples unveiled that the mummy is a "humanoid being" with 23 pairs of chromosomes. The results show that Maria is human, but has a different anatomical structure. However, Prof. Korotkov is not new to scientific controversies. He was part of the team that proposed the use of a photography technique to capture the images of people’s auras. This new technique can diagnose illnesses to replace diagnostic tests like a CT scan and X-rays. He also claims that he has proof of life after death, wherein he had filmed the activity of the soul of a dead person. “I think the whole saga of finding these mummies is laughable and they are very probably fakes. The new evidence does indicate the Maria is human, the only strange thing is that she has an unusual rib structure. This is probably because she is a so-called bone montage made by fakers. The makers claim it can fly as fast as a Formula One car. The Lilium Jet takes off vertically like a helicopter, and then accelerates into forward flight using wing-borne lift. It is powered by 36 separate jet engines mounted on its 10-meter long wings via 12 movable flaps. Only small and inexpensive landing pads that, according to the creators of the aircraft, can be made by anyone are needed. The aircraft is still being further developed. The Airfish 8 could revolutionize travel between thousands of islands in the Philippines, Indonesia, Polynesia and the Caribbean. Traveling to popular or even secluded island destinations will require you to get on the plane or ride a boat. Even then, there are certain areas that ferries and boats cannot reach. But with the existence of the unique marine vessel, called Airfish 8, traveling to those areas can be a lot easier. Running on a race car engine and bearing the look of a seaplane, the Airfish 8 can revolutionize the way people travel. Developed by Singapore-based firm Wigetworks, the craft doesn't need a runway to dock as it can easily land on water, which means harder-to-reach areas like remote islands will be much easier for holidaymakers. Although it looks so much like a plane and hovers, Airfish-8 is registered as a merchant ship.